It could be described as being elegant with its slender leaves covered with a greenish-grey down. This velvety covering is the first sign that this is indeed sage. If you then rub the leaves, the sage aroma that spreads is the unmistakable proof. Sage is a semi-shrub type plant, growing to 20 to 60 cm in height, as it lignifies at the lower end but at the upper end the stems remain soft and covered with felt-like down. From June to July the light violet to blue-violet flowers adorn the velvety bush, gathering together in loose heads and stretching both lips towards you, a sign of labiate plants. It is worth looking at these marvellous flowers more carefully, their lips seeming to form small mouths out of which the stamens project like tongues. Sage tea heals inflammation of the gum, the mouth and the throat, calms the mucous membranes, reduces perspiration and has a positive effect on the stomach and the intestines. The essential oil disinfects and relieves cramp, a property that is promoted by the tannins it contains. In homoeopathy it is used predominantly to inhibit perspiration. As early as the early Middle Ages sage was being used widely in central Europe. It owes to the Virgin Mary its reputation for being able to grant eternal life. According to legend, in her flight to Egypt with the infant Jesus she is said to have hidden from Herod under a sage bush. Many sayings, such as "Whoever grows sage barely looks at death!" (Karl Friedrich Wilhelm Wander), bear witness to its healing properties. Sage is one of the strong August herbs which in churches were dedicated to the dying Mother of God on the feast of the Assumption. These important medicinal plants were herbs that were supposed to protect against magic, conflagration and hailstorms and also aided fertility and made it easier to give birth. They were placed in the seed chest or in the coffin of those who had died. Many were herbs to be burned as incense during religious festivals. Along with yarrow, mugwort, arnica, marigold and sage, familiar herbs such as lovage and dill came to be used as medicines. 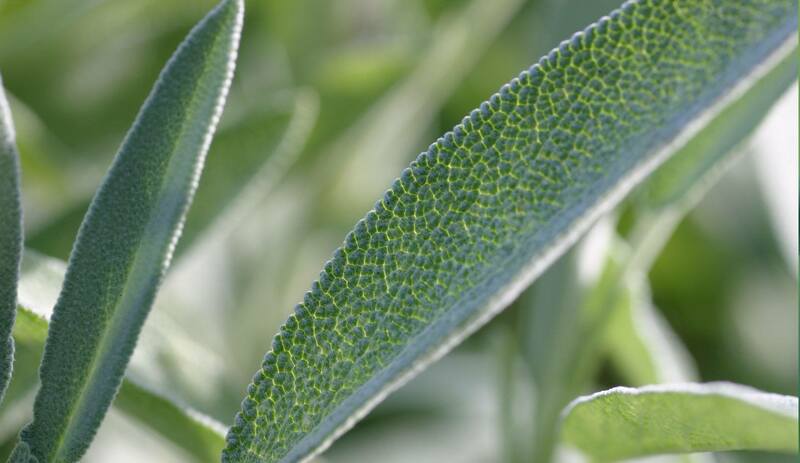 Although the natural habitat of sage is in the warm climates of the Mediterranean, it can withstand cold winters. Ever green, the small bush appears at its freshest and most vital particularly in the cold season: an expression of its great vitality that connects with the physical life forces in man. Therefore sage has a close relationship to the skin as a secreting organ, to the activity of the sweat glands. By helping to connect man more closely to his physical body, sage has a warming effect. In Dr.Hauschka Skin Care, the warming and regulating components are used in many preparations, such as Dr.Hauschka Bronzing Powder, Blush Duo, Sage Purifying Bath Essence, Sage Deodorant, Rose Deodorant, Rosemary Foot Balm, Silk Body Powder, Lemon Lemongrass Vitalising Body Milk, Quince Body Moisturizer and Clarifying Intensive Treatment (age 25+) . Sage is also a component of Dr.Hauschka Med Sage Mouthwash.